"Specialty occupations" in the H-1B program include computer professionals, engineers and scientists, financial analysts, management consultants, university professors, and researchers. Few visas in the U.S. alphabet soup of visa types have become as well-known — or controversial — as the H-1B has in its 20-year history. Reserved for those in "specialty occupations" requiring at least a bachelor's degree, the H-1B has become a mainstay of information technology companies but also is used to bring doctors, teachers, and fashion models to the United States. Since the number of visas is capped at 65,000 a year (with another 20,000 for foreign graduates of U.S. graduate schools), H-1Bs were a hot commodity before the recent recession slashed demand. In good and bad economic times, though, many have criticized the program for displacing U.S. workers and exploiting foreigners. This spotlight briefly describes the origin of the H-1B temporary worker program and uses the Department of Homeland Security's (DHS) report on H-1B visa workers to highlight the number, countries of origin, education, and occupations of temporary highly skilled foreign workers who were granted H-1B visas to work in the United States in 2009. DHS temporary admissions data, reported in the Yearbook of Immigration Statistics 2009, are used in the section on H-1B admissions. Note: All annual data are for the government's fiscal year (FY) (October 1 to September 30) unless otherwise noted. The United States has been admitting skill-based temporary workers since 1952. High-skilled temporary workers were defined and divided into distinct temporary work visa categories as part of the Immigration Act of 1990 (IMMACT90). 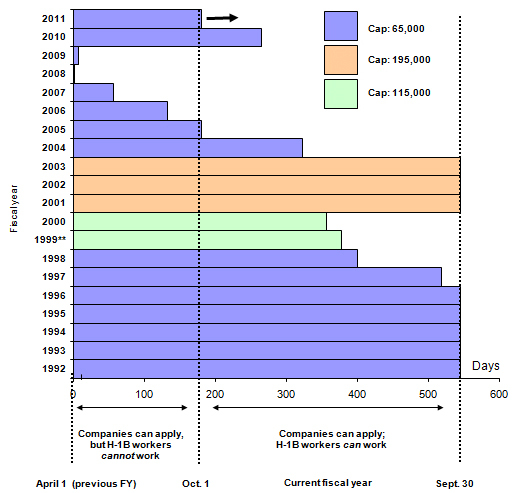 The annual 65,000 cap on the number of H-1B workers has changed a number of times since 1990. As a result of two free trade agreements, 6,800 H-1B visas are reserved for nationals of Singapore and Chile. A portion of H-1B application fees pay for U.S. worker education and training. To protect American workers during the recession, Congress targeted the H-1B program in the American Recovery and Reinvestment Act of 2009. The current cost of filing an H-1B initial employment application is more than $2,300. Congress raised the H-1B fee for certain companies in 2010 to help pay for border security. The number of filed petitions fell by nearly 20 percent between 2007 and 2009. Between 2008 and 2009, the number of filed petitions for initial employment dropped by nearly 14 percent. The general 65,000 H-1B cap for 2008 was filled in just one day, the all-time record. Three out of five approved petitions in 2009 were for continuing employment. More than 27,200 companies and organizations participated in the H-1B visa program in 2009. Thirteen of the 20 top petitioners in 2009 were on the 2008 top 20 list although the rankings changed. Nearly half of the approved H-1B petitions were for nationals of India. The number of petitions for initial employment granted to Indian nationals in 2009 is almost half the 2008 number. Nearly 60 percent of H-1B petitions approved were for workers with an advanced degree. The share of petitions awarded to foreign workers with advanced degrees has increased over time. More than 40 percent of H-1B petitions approved in 2009 were granted to workers in computer-related occupations. The number of approved petitions for workers in computer-related occupations dropped by 35 percent between 2008 and 2009. Average annual compensation was the highest for fashion models ($144,000) and the lowest for workers in religion and theology occupations ($39,000). Nonimmigrants from India composed more than one-third of all H-1B "specialty occupation" worker admissions in 2009. Five states were the intended destination for 54 percent of all H-1B admissions in 2009. Up until 1885, the United States admitted temporary workers as contract laborers, many of whom were unskilled and sought work in railroad construction, shipping companies, fish canneries, or the California gold mines. When Congress passed the first national contract labor law of 1885, temporary workers were prohibited (in most cases) from entering the country. However, the law did leave the door open to certain foreign skilled workers, such as professional entertainers, artists, lecturers, and skilled workers in unspecified industries. The McCarren-Walter Act of 1952 reversed the prohibition against contract laborers entering the United States. This act authorized the admission of temporary workers during labor shortages and began to differentiate between skilled and less-skilled temporary workers by creating the H-1 program for workers of "distinguished merit and ability." Throughout the latter part of the 20th century, high-skilled individuals entered through a single broad category, the H-1 visa, which included health occupations, entertainers, athletes, professors, and other professions requiring advanced knowledge in a particular field. IMMACT90 split the earlier H-1 temporary visa program for foreign workers into H-1B "specialty occupations" visas and H-1A visas for registered nurses. IMMACT90 further separated certain occupations from H-1 visas into their own visa categories: the O visa for scientists, educators, and artists with extraordinary abilities; the P visa for entertainers and athletes who are either internationally recognized or will perform under a reciprocal cultural exchange; and the R visa for religious workers. For the purposes of the H-1B program, the 1990 law defined "specialty occupation" as an occupation that requires "first, a theoretical and practical application of a body of highly specialized knowledge, and, second, an attainment of a bachelor's or higher degree in the specific specialty (or its equivalent) as a minimum for entry into the occupation in the United States." In practice, it meant that in most cases the would-be H-1B workers had to have at least a bachelor's degree in their areas of specialization and, if necessary, a full state license to practice in their field. Specialty occupations include computer professionals, engineers and scientists, financial analysts, management consultants, university professors, and researchers. Fashion models of distinguished merit and ability are also eligible for H-1B visas. can be sponsored or self-sponsored for lawful permanent residence if eligible. IMMACT90 set the original H-1B cap at 65,000 per year. During the late 1990s, when the cap was reached quickly, IT industry representatives lobbied Congress for more foreign skilled workers, citing severe labor shortages that hampered the industry's economic growth. The cap was lifted temporarily to 115,000 visas in 1999 and 2000 as the result of the 1998 American Competitiveness and Workforce Improvement Act (ACWIA) and then again to 195,000 visas for 2001, 2002, and 2003 under the 2000 American Competitiveness in the 21st Century Act (AC-21). The latter also exempted nonprofit or government research organizations, institutions of higher education, and other nonprofit entities from the visa cap altogether. The annual H-1B cap reverted to 65,000 in 2004 and has remained at that level despite efforts to increase it in recent years. The Securing Knowledge Innovation and Leadership Act of 2006 (or SKIL bill) and Security Through Regularized Immigration and a Vibrant Economy (STRIVE) Act of 2007 aimed to raise the cap to 115,000 at least temporarily. The H-1B Visa Reform Act of 2004 Act added 20,000 H-1B visas for eligible H-1B applicants holding advanced degrees from U.S. universities. (Note: Once U.S. Citizenship and Immigration Services (USCIS) receives 20,000 petitions for foreign workers with U.S. advanced degrees, all further petitions for such workers are counted toward the general 65,000 cap. When the 65,000 cap is reached for a fiscal year, USCIS announces that the cap has been filled and rejects further petitions subject to the cap. Signed into law in 2003 and effective on January 1, 2004, free trade agreements with Chile and Singapore created a new H-1B1 visa that annually reserves 1,400 such visas for Chilean and 5,400 for Singaporean skilled workers. Consequently, the overall H-1B cap was reduced by 6,800. The law stipulates that unused H-1B1 visas are be added to the cap in the next fiscal year. For example, the 2010 numerical limit is 58,200 (i.e., 65,000 minus 6,800). However, since 6,100 H-1B1 visas were unused in 2009, they were added to the 58,200 regular-cap visas available in 2010 for a total of 64,300 regular-cap visas. The conditions of admission under the H-1B1 visa differ somewhat from the regular H-1B visa (read more here). For instance, whereas H-1B workers are allowed to work up to three years (with a one-time extension of another three years), H-1B1 workers initially are admitted for a maximum of one year with an opportunity to extend H-1B1 employment an indefinite number of times as long as they can demonstrate they do not intend to remain in the United States permanently. A portion of H-1B application fees pays for U.S. worker education and training. In 1998, ACWIA established a $500 fee companies had to pay for each foreign worker they wished to hire on an H-1B visa. The receipts from this fee went into a fund so that U.S. citizens, lawful permanent residents, and other U.S. workers could attend job training and receive low-income scholarships or grants for mathematics, engineering, or science enrichment courses administered by the National Science Foundation and the Department of Labor. This fee increased to $1,000 when AC-21 became law in 2000, and it rose to $1,500 with the H-1B Visa Reform Act of 2004. The American Recovery and Reinvestment Act of 2009 (also known as the stimulus bill) incorporated the Employ American Workers Act (EAWA) by senators Bernie Sanders (I-VT) and Charles Grassley (R-IA). This provision limits banks and other financial institutions receiving funds from the Troubled Assets Relief Program (TARP), a measure intended to restore liquidity and stability to the U.S. financial system, from hiring H-1B workers in occupations in which they had laid off U.S. workers. In addition, companies receiving TARP funds must comply with H-1B–dependent employer requirements. According to the Department of Labor, H-1B–dependent employers are those "whose H-1B workers comprise 15 percent or more of the employer's total workforce. Different thresholds apply to smaller employers." One of these requirements is attesting that the company offered the position to an equally or better-qualified U.S. worker first (see all the requirements here). As a result of EAWA, some banks withdrew job offers made to foreign MBA students graduating from U.S. business schools. Fraud Prevention and Detection fee of $500 established by the H-1B Visa Reform Act for H-1B petitions. Employers may choose to pay a $1,000 premium processing fee so that USCIS processes the application within 15 days of filing. These application fees do not include the cost of having an immigration attorney prepare the application package. Legal fees range widely and can be anywhere between $1,000 and $4,000. As of August 14, 2010, companies with 50 or more employees that have more than 50 percent of their U.S. workforce on an H-1B or intracompany transfer visa (L visa) must pay $2,000 for a petition in addition to other fees, bringing the total to about $4,320 per visa. The increase mainly affects Indian offshore firms, which use Indian nationals on H-1B visas to serve U.S. customers. The fees are intended to pay for $600 million in border security measures, including unmanned aerial drones and the hiring of Border Patrol and Immigration and Customs Enforcement officers. The number of petitions filed and approved fluctuated in the last decade (see Figure 1 and Table 1). The recession that lasted from March 2001 to November 2001 dampened interest in hiring H-1B workers (recall that the cap was set to 115,000 for 1999 and 2000, and 195,000 for 2001 through 2003). As a result, the number of filed petitions plummeted from the decade high of 342,035 in 2001 to 215,190 in 2002. As the economy improved, the number of filed and approved petitions rose. The 2008-2009 recession, which officially started in December 2007, also affected H-1B demand and was one of the main factors behind a decline in both filed and approved petitions. The number of filed petitions fell by nearly 20 percent between 2007 and 2009 (from 304,877 to 246,647) but did not drop below the levels seen in 2001. Source: DHS, Characteristics of Specialty Occupation Workers (H-1B), various years. The number of filed petitions for initial employment fell by 13.7 percent between 2008 and 2009 (compared to an increase of 7.3 percent between 2007 and 2008), and the number of approved petitions dropped by 21.1 percent compared to a smaller decline of 8.9 percent between 2007 and 2008. The number of filed petitions for continuing employment fell by 15.2 percent (and by 12.9 percent between 2007 and 2008) and the number of approved petitions dropped by 23.3 percent (compared to a small increase of 3.4 percent between 2007 and 2008). U.S. employers are allowed to apply for an H-1B visa six months before the first day of employment. The employment in a given fiscal year starts on October 1 although it can be later. Therefore, the first day for applications is April 1 unless April 1 falls on a weekend or holiday. The shortest period in which enough H-1B applications were submitted for the cap-subject initial employment visas was in April 2007 (see Figure 2). The fiscal year 2008 general 65,000 cap was reached in just one day, and the advanced degree cap in six. The recession of 2008-2009 reversed this trend. In December 2009, USCIS reported that the 2010 cap had been reached — 265 days after it began accepting applications. Between 1992 and 1996, the 65,000 cap was not reached, nor was the 195,000 cap from 2001 to 2003. Once the cap reverted to 65,000 for 2004, it was reached more quickly every year between 2004 and 2008. As of October 1, 2010, USCIS reported that the agency had received 40,600 general visa petitions subject to the 65,000 cap and 14,900 advanced degree petitions subject to the 20,000 cap. In other words, neither of the two caps had been reached as of the beginning of FY 2011. Note: *The general cap refers to the 65,000 annual visas. The 20,000 additional visas for foreign graduates of U.S. advanced degree programs were counted separately and had their own cut-off dates. **No information is available on the exact date when the cap was reached for 1999, so the average of 1998 and 2000 was used. Source: DHS, USCIS press releases. Of the 214,271 petitions approved in 2009, a total of 127,971 petitions, or 59.7 percent, were for continuing employment, a share in line with recent trends (see Figure 3). Since 2003, the majority of approved petitions have been for continuing employment (see Figure 3). This trend is partly due to the provision of AC-21 that allows foreign workers on valid H-1B visas to switch employers as soon as the new employer files a new petition rather than when such petition is approved. According to the USCIS list of approved petitioners for initial employment, there were 27,288 petitioners whose applications were approved. These petitioners represented diverse industries such as IT consulting, education, banking and finance, and health care, to name a few. The data described in this section refer to H-1B petitions that companies have filed with DHS and that DHS has approved, not H-1B workers who arrived or already reside in the country in a given fiscal year. The number of petitions is generally greater than the number of H-1B workers since more than one employer may file a petition on behalf of an individual foreign worker. 2. The cap is applied only for initial employment while continuing employment is cap-free. "Initial employment" refers to petitions for first-time H-1B employment with employers who are subject to the cap, while "continuing employment" refers to petitions for extensions with the same employer or for transfers to a different employer. In both cases the maximum amount of time on an H-1B visa is six years. U.S. employers may begin applying for the H-1B visa six months before the actual start date of the visa. Since the government fiscal year begins October 1, employers can petition USCIS on April 1 of the same year. Even when approved, the H-1B worker cannot start work until October 1 of that fiscal year. The top five petitioners accounted for 6.2 percent of the 85,133 petitions approved (see Table 2). They were Wipro Ltd. (1,964 approved petitions), Microsoft (1,318), Intel (723), IBM India Private Ltd. (695), Patni Americas, Inc. (609). The next 15 petitioners accounted together for another 5.7 percent (or 4,867 applications). Source: DHS; USCIS Reports and Studies: H-1B Petitions and H-1B Workers. The top 20 companies and the number of applications they were approved for changed from 2008 to 2009 both in terms of composition and ranking (see Table 2). In 2008, the top four petitioners were Indian outsourcing companies (Infosys Technologies Ltd., Wipro Ltd., Satyam Computer Services Ltd., Tata Consultancy Services Ltd.) that together had nearly 10 percent of the 109,335 approved applications. Only two of them remained on top 20 list in 2009 (Wipro Ltd. and Infosys Technologies Ltd.). Infosys Technologies had only 440 applications approved in 2009 compared to 4,559 in 2008. Also, two public school systems in Maryland fell off the top 20 list in 2009 while Goldman Sachs (finance industry) and RITE AID corporation (retail) joined. Microsoft, ranked fifth among petitioners in 2008 (1,037 approved applications), rose to second place in 2009 (1,318), and Intel jumped from 11th to third place. The number of approved petitions increased for eight firms from 2008 to 2009 (Ernst & Young, IBM India Private Ltd., Intel, KPMG LLP, Larsen & Toubro Infotech Ltd., Microsoft, Patni Americas Inc., and Qualcomm). 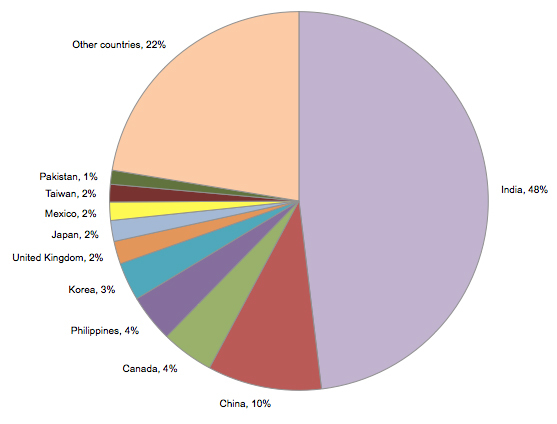 In 2009, 48 percent of H-1B recipients were from India, followed by China, Canada, the Philippines, Korea, the United Kingdom, Japan, Mexico, Taiwan, and Pakistan (see Figure 4). Together these 10 origin countries accounted for more than three-quarters of approved petitions (166,294 petitions or 77.6 percent). Source: DHS, Characteristics of Specialty Occupation Workers (H-1B), FY 2009. The number of petitions for initial employment awarded to foreign workers from India dropped 45 percent from 61,739 in 2008 to 33,961 in 2009. Indian workers' share of all petitions for initial employment also declined from 56.5 percent to 39.4 percent. In contrast, the applications granted to Canadian nationals increased by 15.4 percent (from 3,968 to 4,579) and by 29.3 percent for Korean nationals (3,029 to 3,919). Of the 214,271 petitions approved, 40.9 percent (or 87,668) went to foreign workers with a bachelor's degree or its equivalent, 39.9 percent (or 85,489) to those with a master's degree, 12.6 percent (or 27,027) to those with a doctorate degree, and 5.7 percent to those with a professional degree. In 2000, 41 percent of approved petitions went to foreign workers with an advanced degree compared to 58 percent in 2009 (see Figure 5). The share of petitions awarded to those with a master's degree increased by 3 percentage points between 2004 and 2005 following the H-1B Visa Reform Act of 2004, which made 20,000 additional H-1B visas available to H-1B applicants with advanced degrees from U.S. universities. In 2009, 41.6 percent of petitions (88,961) were approved for workers in computer-related occupations, mainly systems analysts and programmers (see Table 3). Source: DHS, Characteristics of Specialty Occupation Workers (H-1B), FY 2008 and FY 2009. Petitions for foreign workers to be employed in architecture, engineering, and surveying accounted for 11.8 percent (or 25,278) of all approved petitions in 2009 and those in education accounted for 11.6 percent (or 24,711). The next two occupational groups were administrative specializations (21,192 petitions or 9.9 percent) and medicine and health (17,621 or 8.2 percent). Together these top five occupational groups accounted for 177,763 or 83.1 percent of all approved petitions in 2009. The number of approved applications for computer-related occupations dropped from 137,010 in 2008 to 88,961 in 2009 or by 35.1 percent (see Table 3). The number of approved applications for initial employment in these occupations dropped by 48.7 percent from 58,074 to 29,793. As a result, the share of petitions for workers in computer-related occupations among all occupations decreased from 49.6 percent to 41.6 percent for all petitions and from 53.2 percent to 34.6 percent for initial employment petitions. The 200 fashion models in 2009 represented a tiny share (less than 1 percent) of the total H-1B petitions (with known occupations) on the list of approved H-1B applications, but their employers were willing to offer the highest annual compensation: one-half were expected to earn between $100,000 and $150,000 with an average salary of $144,000. The 1,395 foreign workers in law and jurisprudence were expected to earn the second highest salary ($116,000 on average), followed by workers in management ($94,000 on average) and medicine and health ($89,000 on average). The average annual compensation for those in computer-related occupations was reported to be $74,000, just above the $73,000 average for all H-1B workers approved in 2009. Temporary visa data — which includes data on H-1B admissions — count admissions, not individuals, of those who are admitted with an I-94 form. In some cases, temporary visa holders may enter the country more than once in any given year. Of all 339,243 temporary worker admissions under the H-1B "specialty occupation" visa in 2009, 36.3 percent (123,002) were from India alone (family members are not included in these figures). Five countries — India plus Canada (6.5 percent or 22,156), the United Kingdom (4.3 percent or 14,610), Mexico (4.2 percent or 14,352), and China (3.8 percent or 12,922) — accounted for 55.1 percent (187,042) of all H-1B admissions in 2009. Of all 339,243 H-1B temporary worker admissions (family members are not included in this figure) in 2009, 16.0 percent (54,212) intended to go to California, 15.9 percent (53,961) to New York, 8.4 percent (28,620) to Texas, 7.2 percent (24,444) to New Jersey, and 6.9 percent (23,431) to Florida. Department of Homeland Security. 2010. Temporary Admissions (Nonimmigrants) [various tables]. In Yearbook of Immigration Statistics: 2009. Washington, DC: DHS. Available online. U.S. Citizenship and Immigration Services. 2010. Characteristics of H-1B Specialty Occupation Workers: Fiscal Year 2009 Annual Report. Washington, DC: Department of Homeland Security. Available online. ———. USCIS Program Reports. Available online. H-1B Fiscal Year (FY) 2011 Cap Season. Available online. H-1B Specialty Occupations, DOD Cooperative Research and Development Project Workers, and Fashion Models. Available online.